Almost 65% of the Tanzanian population is under the age of 24 and almost 20 % of the population is aged 15-24 years. Yet, this important group faces many significant health challenges, such as early sexual debut, early pregnancies, risky behaviours and sexually transmitted infections. 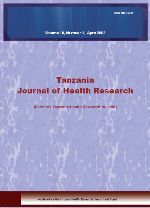 The objective of this study was to assess knowledge, attitudes and practices on family planning services among adolescents in secondary schools in Hai District in northern Tanzania. A cross sectional study was conducted between April and June 2011 among 316 randomly selected students in 10 secondary schools using a self administered pre-tested questionnaire. Median age of participants was 17 years (15-19 years). Two-thirds (67.4%) of the respondents had adequate level of knowledge on family planning services (FPS) and the most popular source of information was the radio (65.8 %). Being in a lower class (χ2 =8.6; P<0.02) and attending co education schools (χ2 =12.9; P< 0.001) were predictors of inadequate level of knowledge on FPS. Most, 71.2% (225/316) respondents reported that FPS should not be used by adolescents and mentioned several reasons against its use. Less than 6 % (18/316) of all respondents had used FPS in their lifetime, with 44.4 % (8/18) in the past month, 33.3 %( 6/18) in the past year, and 22.3 % (4/18) in the past 5 years. In conclusion, most secondary school students in Hai District do not utilize family planning services despite of adequate level of knowledge on FPS. Interventions to improve utilization of FPS among secondary school students should address barriers to low utilization of FPS mentioned in this study.